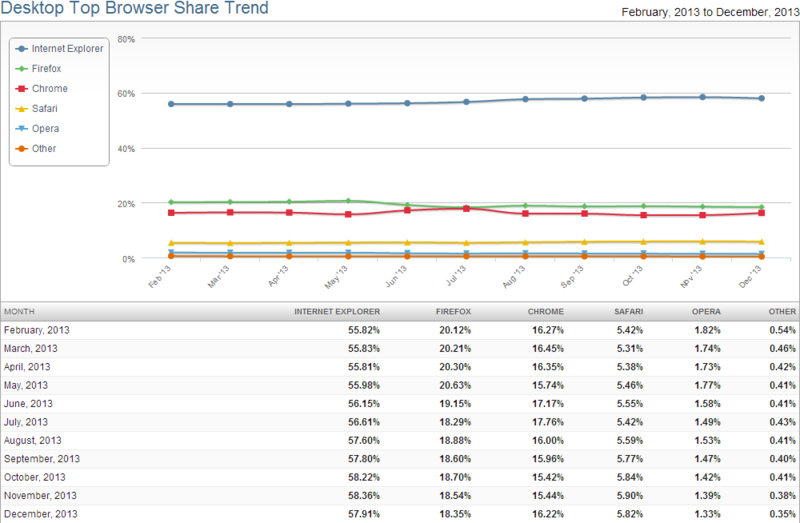 As you can see, Chrome is now the only web browser whose user share is increasing. Internet Explorer's share decreased after a long time. Firefox and Safari also went down by some points. is Net Applications accurate at all? I've seen weird things from them in the past. I do expect Chrome to overtake Firefox to become the second most popular browser, that would not be a surprise. It doesn't help that Firefox hasn't been doing a good job lately. I don't know about others, but I was a huge fan of Google Chrome from day 1. However, lately, Google Chrome has been crashing far too often for me to use (stable build), it keeps freezing up randomly on webpages and gobbles up waaay too much RAM (I make no apologies for being on 2GB) and hog too much CPU. I also don't understand how the simplest of extensions can take up more memory than my word processor. So I gave IE 11 a try, and I am extremely impressed with IE 11's speed. I guess people are okay with Chrome, but I'm going to stick with IE 11 until Chrome gets fixed. IE 11 is kinda underrated. How they collect this data? Let's not forget we can thank Chromecast for the rise of the chrome browser since that device relies on google chrome even though there are workarounds that can enable you to view or use your locally stored files for viewing on a HDTV.